Head of the Reform and Reconstruction Alliance, Sayyid Ammar al-Hakim, in the holy city of Najaf, met with His eminence Sheikh Isa Qassim Thursday, 27/12/2018. His eminence indicated that Sheikh Isa is welcomed to Iraq and Holy Najaf and Iraqi people look up to him with high affection and respect. His eminence with Sheikh Isa Qassim discussed concerns of the Islamic world and the concerns of followers Ahlul bayt , stressed the importance of intellectual and cognitive solutions to the challenges facing the Islamic nation. Sheikh Isa Qassim was briefed about the achievement after defeating Daesh and retaking the Iraqi soil. 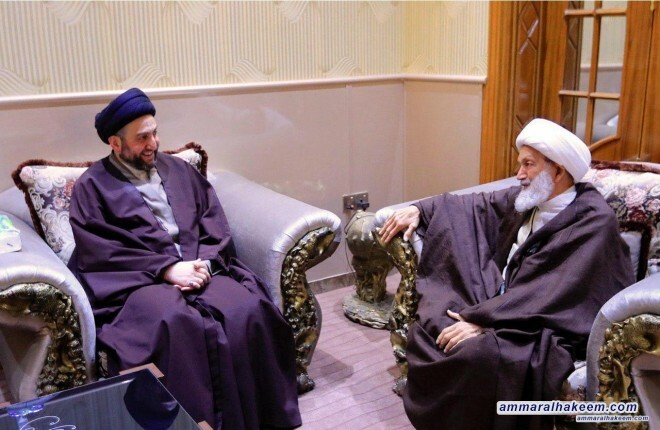 His eminence explained to Sheikh Isa Qassim that Iraq won on political level when unity of Iraq became the slogan for all and and true believe in preserving rights, and military level by defeating the terrorist Daesh, and on social level by renouncing sectarianism and racism and restoring social harmony. And pointed out the importance of service and development as a victory that all Iraqis are looking for. His eminence wished Sheikh Isa Qassim a good stay in Iraq.